In agreement, wool is fabulous…. I have long been a fan of Odile Gova, proprietor of Woollyfabulous on Etsy. She works with wool, embroidery and brass zippers. She has a style and technique that is all hers! I love what she makes….she has a gift! 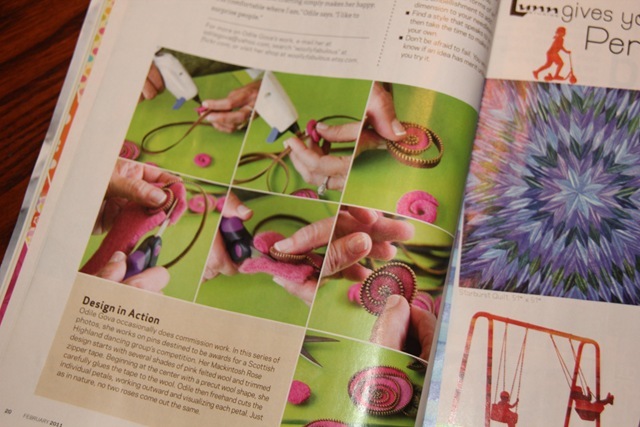 When my friend, Gail, mentioned that an artist who made brooches of felted wool and zippers was featured in the American Patchwork and Quilting , Feb 2011 magazine ….I immediately knew from her description who it was……Odile, of course…..
Much more fiddly than it appears! Here is my first attempt…..LOL! Let me say here that I do not want to copy the work of Odile, I want my work to look much different from hers . 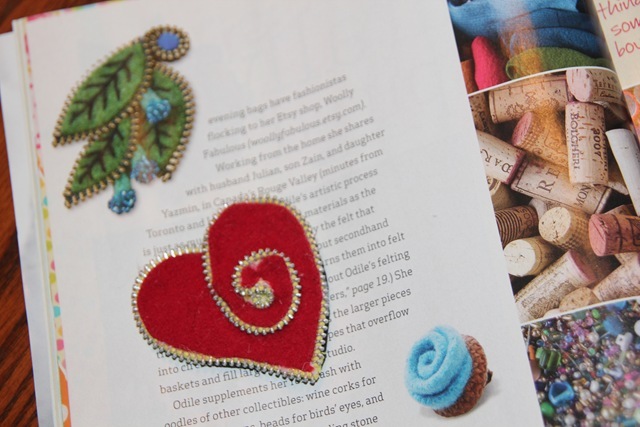 But, nonetheless, I am geeked by the idea of incorporating zippers, and maybe even wool balls, cording, a little embroidery, and needle felting into the brooches (embroideries, wall pieces???) I make….and to see where this idea leads me….maybe a dead end….maybe not. I just want to thank Odile, and give her credit for the wonderful inspiration! Experimenting with new ideas, and evolving are what keeps the brooches interesting, challenging and fun to make. 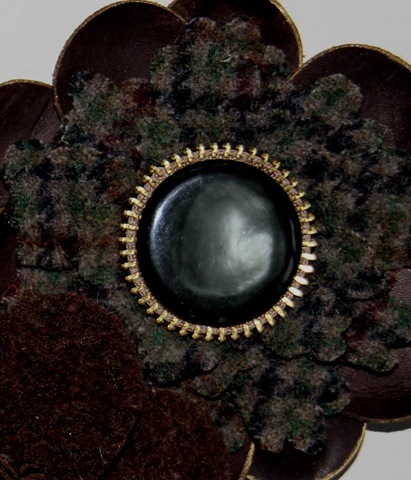 I was a little happier with the zipper tape installed around the button of this brooch….. a start. Absolutely, give it a try. Its nice to actually use the stuff we save! Thanks for commenting! I was in the store at the mall today and saw some really pretty pins I liked. There was a real pretty gray one with a pink button-had to rush home and see if it went with any of my clothes. I LOVE them. 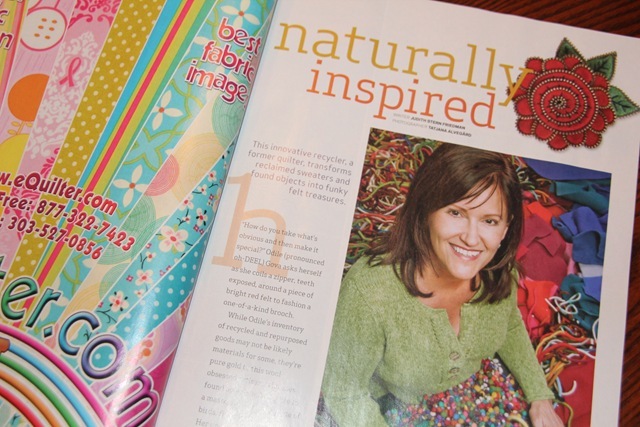 I know how much you admired woollyfabulous, how wonderful for Gail to have found the article! Great job, Deb, I love the zipper around the button! You are amazing and fearless and, oh so, creative! Very cool! I know you’ll come up with your very own, always inspired, Esther Stephania creations… can’t wait to see them.